Authorities have foiled hardline Hurriyat Conference’s plans of holding a seminar on Sunday by placing several top leaders including the amalgam’s chairman Syed Ali Shah Geelani under house arrest. “The residence of Geelani has been converted into an unofficial jail. No one is allowed to enter or leave the premises,” an aide of Geelani said. He said while Geelani is under house arrest since last week, Hurriyat spokesperson Mohammad Ashraf Sehrai, Ayaz Akbar and Raja Mehraj-ud-din were placed under house arrest on Saturday. Geelani, while condemning the move, said the government has shown intolerance even to peaceful programmes. 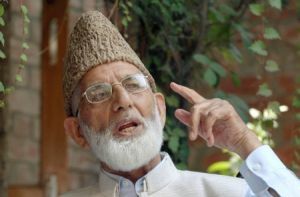 “The government has completely buried the ‘Battle of Ideas’ slogan of the (chief minister) Mufti Mohammad Sayeed,” Geelani said in a statement. The Hurriyat had planned to hold a seminar to which several separatist leaders, including from Sikhs groups, and Christian community representatives were invited. “Hurriyat Conference has decided to organise a seminar in Srinagar on June 14 in which people from different walks of life will express their views on the topic ‘How to Resist the Indian State Fascism’,” a spokesman of the separatist amalgam had said earlier this week. Those invited to the seminar include Akali Dal leader Simranjit Singh Mann, Dal Khalsa leader Kanwarpal Singh, noted human rights activist Gautam Navlakha and representatives of the Christian community. Deputy Chief Minister Nirmal Singh, while talking to reporters in Jammu on Friday, had said the government will not allow “anti-India” activities in the state. “No such rally or seminar will be allowed in the land of Jammu and Kashmir,” Singh had said. Is Modi govt's economic report card satisfactory?